What next for the NBA's 'ownerless' team? After being utterly devastated by Hurricane Katrina back in 2005, New Orleans has rallied around its sports teams for inspiration. In fact, the NFL Saints’ Super Bowl triumph earlier this year is used as a symbol of how the city has come back from the disaster stronger than ever. New Orleans fans have also loyally supported its only other professional sports franchise - the NBA's Hornets. But while the Saints may march on to another Super Bowl run this year, the future of the basketball operation is murky after becoming the first team in history to be owned by the NBA. Hornets fans face the painful possibility of losing their team to another city – an all-too normal occurrence in U.S. sports. 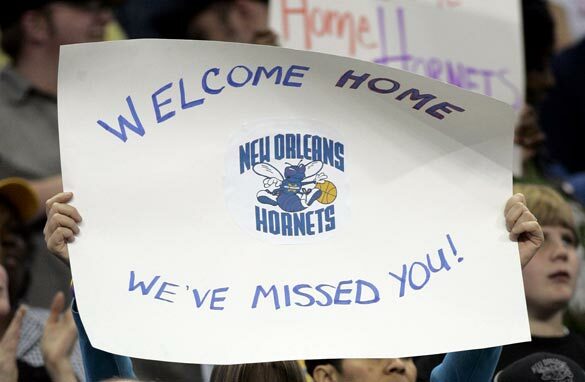 After all, the Hornets themselves moved to New Orleans from Charlotte in 2002. So how did the sale to the NBA come about? The Hornets were sold to the league on Monday when team owner George Shinn finally decided to wash his hands of the franchise he founded in Charlotte over 20 years ago. Shinn had been unsuccessfully trying to offload the club to minority owner Gary Chouest. NBA commissioner David Stern says the league will preferably look to sell the club, valued at around $300 million, to an owner that would keep the Hornets in New Orleans. For all the reasons that one might question the league for owning a team, albeit temporarily, the fact Stern will seek a buyer with no travel plans for the team is not one of them. In fact, fans in Seattle probably wish the league had done the same to the old SuperSonics a couple of years ago. Remember, the Sonics’ ownership group chairman Howard Shultz (also the CEO of Starbucks) sold the franchise to an Oklahoma City businessman in 2006. Just two years later the storied Sonics left Seattle after a 41-year stay to move east and relocate. The Oklahoma City Thunder, as they are now known, are currently thriving as one of the NBA’s best young teams, while Seattle fans are left contemplating what could have been. Sadly teams picking up their bags and changing cities is fairly common among U.S. professional sports. Some of the most famous instances are the LA Lakers leaving freezing Minneapolis in 1960 for the warm comforts of Hollywood. At least the team didn’t change its name, given that it moved out of Minnesota – the land of 10,000 Lakes. Can you imagine Jerry West or Magic Johnson balling it up in Minneapolis? They would have been able to go ice-fishing in winter during their weekends instead of strolling down the Hollywood Walk of Fame. Team relocation is not unique to the NBA. Some NHL, NFL and MLB teams have left their adoring fans to make new ones. Ice hockey's Winnipeg Jets became the Phoenix Coyotes, while the NFL’s Tennessee Titans used to be the Houston Oilers. Staying with football, the Colts have actually won a Super Bowl while in Baltimore and, more recently, in their present home Indianapolis. Curiously, baseball’s Braves were founded in Boston way back in 1871 (under a different name) and resided in Milwaukee from 1953 to 1965 before settling in Atlanta. Can a Manchester United fan imagine their club’s owner moving the team to Liverpool? What would the Real Madrid fan base do if their team was headed to Catalonia? It’s safe to say moves like that would never happen. But in U.S. sports teams have changed homes and will continue to do so. The Hornets have already moved once in their history. Fans can only hope that the team’s temporary stay under the wings of the NBA will lead them to a worthy owner, but not new pastures. No mention of the Vancouver Grizzlies. To think that Vancouver/Seattle basketball fans must travel all the way to Portland to experience NBA basketball is horrendous. Canadian NBA fans deserve more then one team. Vancouver (Rogers Arena), Ottawa (Scotiabank Place), and Montreal (Centre Molson) could all support an NBA team. As a lifelong basketball coach ( recently retired ) my worry is not that teams will move : It is the game itself that I worry about. It used to be a game for every kid on any block but now, unless you are over six-foot-eight tall AND built like a tank the kids had better think about soccer. It's such a pity because basketball used to be for everyone.